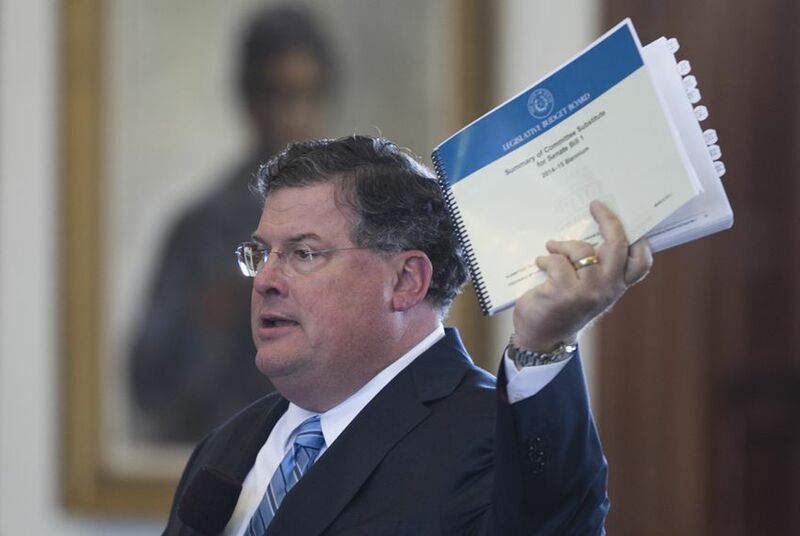 The full Texas Senate will consider a plan to spend about half of the projected $11.8 billion balance in the state's Rainy Day Fund for transportation and water projects, though Democrats plan to push for money for schools as well. Senate Finance Committee Chairman Tommy Williams, R-The Woodlands, on Thursday morning laid out an ambitious plan to spend $6 billion from the state’s Rainy Day Fund while also setting the stage for a serious debate in the remaining weeks of the session on whether to tap the fund for public education. Williams' proposal, called Senate Joint Resolution 1, would ask Texas voters to approve spending $3.5 billion on transportation projects and $2.5 billion on water projects. The comptroller’s office has projected the fund, fed largely by taxes on the state’s oil and gas production, will grow to $11.8 billion by the end of the next biennium. The Senate Finance Committee unanimously voted the resolution out of the committee to be considered by the full Senate. Williams said he was willing to consider amendments to the resolution that would put money toward public education. Since last year, Democrats in both the House and Senate have suggested tapping the fund to help restore some of the cuts made to schools in 2011. Most Republicans in the Legislature have dismissed the proposal as a nonstarter, explaining that the fund should not be used for recurring expenses such as school spending. “I’m willing to consider a thoughtful amendment that would address some of our public education concerns,” Williams said. He also didn’t rule out considering amendments related to spending from the fund on health-related state expenses. “We will discuss it, we will address it and we will resolve it,” Sen. Royce West, R-Dallas, said after proposing to add $2.4 billion in Rainy Day Fund spending to Williams’ plan for public education. Though the committee unanimously approved Williams' resolution, senators’ remarks predict that the measure will launch a spirited debate on the Senate floor over funding for schools. Williams’ proposal as drafted would create two new state funds: the State Water Implementation Fund of Texas, also known as SWIFT, and the State Infrastructure Fund. The former would be used to fund projects in the statewide water plan, which lists $53 billion in water-supply projects including reservoirs, wells, pipelines and desalination facilities. The portion of the plan going to transportation was less well-received, as some senators worried the plan wouldn’t do enough to address a projected funding shortfall at the Texas Department of Transportation and would increase public debt. Under Williams’ proposal, TxDOT would largely make use of the State Infrastructure Fund to help local communities move forward with road, port and freight rail projects by either loaning out money for the projects or helping public entities borrow money for the projects at lower interest rates. Williams, a former Senate Transportation Committee chairman, made it clear that he did not believe his plan was enough to address the state’s transportation issues. TxDOT has said it needs $4 billion in new revenue each year just to keep traffic levels around the state from getting worse. “I don’t believe this is the silver bullet that’s going to solve our transportation problems, but I believe it’s part of a solution that must include robust new funding for road construction,” Williams said. State Sen. Kevin Eltife, R-Tyler, who has been critical of TxDOT’s reliance on debt over the last decade to fund road projects, said he worried the plan would allow lawmakers to ignore the agency’s need for more revenue. “To me this is just a Band-Aid,” Eltife said. He said the measure would “push the leverage to the local level,” a characterization that TxDOT Chief Executive Officer Phil Wilson did not dispute. The proposal would allow the Legislature to significantly increase its spending from the current budget while not running afoul of the state's constitutional spending cap, a complicated measure that would require a politically tricky majority vote in both chambers to bust. Ursula Parks, director of the state's Legislative Budget Board, told lawmakers that the spending limit does not apply to expenditures explicitly dedicated in the state's Constitution. If voters approve the spending in Williams' resolutions, that $6 billion would not be subject to the limit, she said. State Sen. Jane Nelson, R-Flower Mound, didn't want anyone to miss Parks' point. “The answer is it does not bust the spending limit," Nelson said. "You should reiterate that."